Emerging market debt (EMD) can be a powerful diversifier and yield enhancer for global bond portfolios. Yet a common question among investors is how best to allocate to the asset class. Specifically, what is the optimal level of EMD exposure, how should one approach currency and what is the best EMD investment approach? Below we discuss this and provide an example from the perspective of a European investor. Featuring a wide mix of risk and return factors, EMD offers investors multiple dimensions in which to invest, including by country, currency, maturity/duration, credit sector and quality. This is a fruitful hunting ground for constructing both beta and alpha-driven portfolios, and importantly, capitalising on idiosyncratic risk. For investors convinced that EM debt offers an opportunity, the first consideration is the objective of their portfolio. Should it be a relative, absolute or total return approach? This is an important consideration as each approach will lead to a different allocation level. Most discussions on EMD investing begin with the well-established single-strategy, relative return approaches. This then frames decisions on where to invest by relying on industry-convention benchmarks to define the different asset segments. Yet arguably, the role of market-cap weighted benchmarks in directing these allocations is too large. The most indebted countries take up a disproportionate share of risk and the indices have little bearing on an investor’s objectives. In contrast, recent years have seen a growing trend towards absolute and total return EMD approaches. There are various approaches within this: simple blended strategies have a static benchmark mix of both hard and local currency indices, allowing the portfolio wide discretion to allocate between the asset segments. Other approaches have an absolute return objective and try to achieve positive returns in all stages of the market cycle, thereby focussing exclusively on alpha. In contrast, total return approaches aim to offer a balance of beta and alpha. So, which do you choose? For investors seeking to maximise risk-adjusted returns, total return approaches standout. For those seeking a less-volatile defensive portfolio, absolute return may be best suited - although this typically requires a high degree of market neutrality (or exceptional market timing) which removes the risk premium that attracted investors into EMD to begin with. Finally, for investors who require granular building blocks that can be tightly budgeted and used within a wider portfolio, single-strategy approaches may be most appropriate. However, such strategies typically leave investors exposed to the biases and inefficiency of market-cap weighted benchmarks. Our preferred approach is total return. 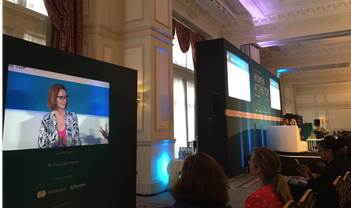 In practice, this should offer better risk-adjusted returns over the single-strategy EMD, deliver controlled risk within a well-defined budget and have sufficiently wide flexibility to maximise alpha and capitalise on all EMD opportunities. While downside risk can be mitigated given its flexibility, it’s important to recognise that these strategies will persistently have EMD beta through the cycle. This can improve returns over the long run by reducing excessive trading (and transaction costs) and ensuring risk premium and carry is captured throughout the cycle. In addition to offering a credit and carry risk premium worth capturing, the key benefit for investors into EMD is that it introduces a diversified source of risk into a portfolio. This is especially important in an environment of historically low government yields and tight credit spreads. For instance, we estimate that 40 per cent of the variations in return from an EMD total return strategy have historically reflected idiosyncratic risk. Put differently, 40 per cent of historic return variability cannot be explained by macro swings in global government bond yields or credit spreads. 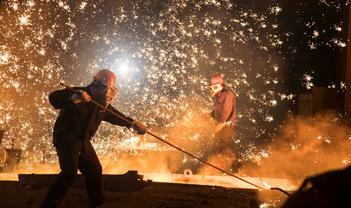 This makes EMD a powerful complement to traditional bond portfolios. Source: Fidelity International and Bloomberg, August 2018, based on monthly historic data from July 2004 to July 2018, combines backtested strategic allocation performance of the Fidelity Emerging Market Total Return Debt strategy and live fund performance (gross of fees, from October 2015). Backtested asset allocation comprises of a dynamic blend of the following JPMorgan indices: GBI-EM GD: Global Bond Index – Emerging Markets Global Diversified (Local Currency). CEMBI BD: Corporate Emerging Market Bond Index – Broad Diversified (USD Corporates). EMBIG: Emerging Market Bond Index Global (USD Sovereigns). Indices used for regressors: Bloomberg Barclays Global Aggregate Credit Hedged USD, Bloomberg Barclays Global Aggregate Treasuries Hedged USD and ICE LIBOR USD 1M. Credit regressor calculated as difference in returns between credit and treasuries. Government regressor calculated as excess return of treasuries to cash. Analysis conducted using USD returns. For any EMD investment, a key consideration is how to manage the currency risk, particularly those involving local currency bonds. For purely hard currency investments, it may be beneficial to have open currency risk. We estimate 30-40 per cent as the optimal level of open currency exposure for a European investor into dollar-denominated EMD corporates and sovereigns. When EM spreads widen, this typically coincides with a stronger dollar. In addition to improving the risk efficiency, this approach also reduces an investor’s exposure to the cross-currency basis between USD and EUR, which typically has worked against an investor hedging from USD to EUR. For investments solely into EM local currency bonds, fully hedging EM currency exposure would remove a source of expected return. Therefore, our analysis looks at hedging applied at the portfolio level from the portfolio reference currency of USD. 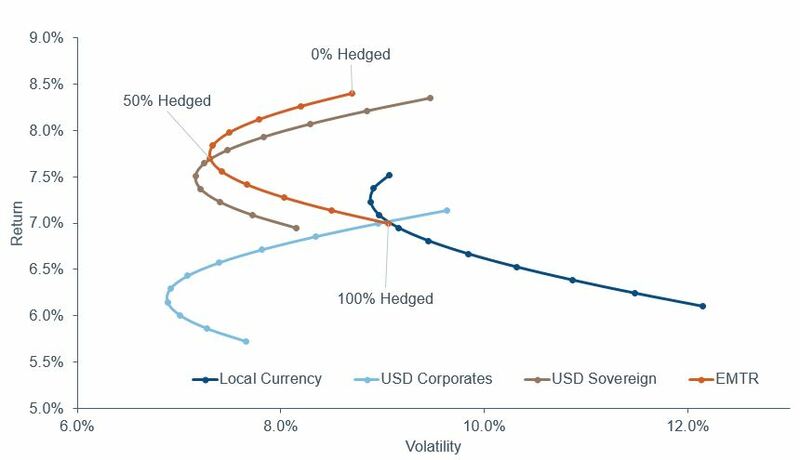 A full USD/EUR hedge (in effect a USD short position) would have introduced substantial additional risk to a local currency portfolio, however, a modest 20 per cent hedge would have been optimal from a volatility control point-of-view. In the context of a total return portfolio (or one that blends different EMD categories as described above), we estimate that 50 per cent is the optimal hedging level for the USD/EUR cross, consistent with a 50 per cent hard currency reference exposure. 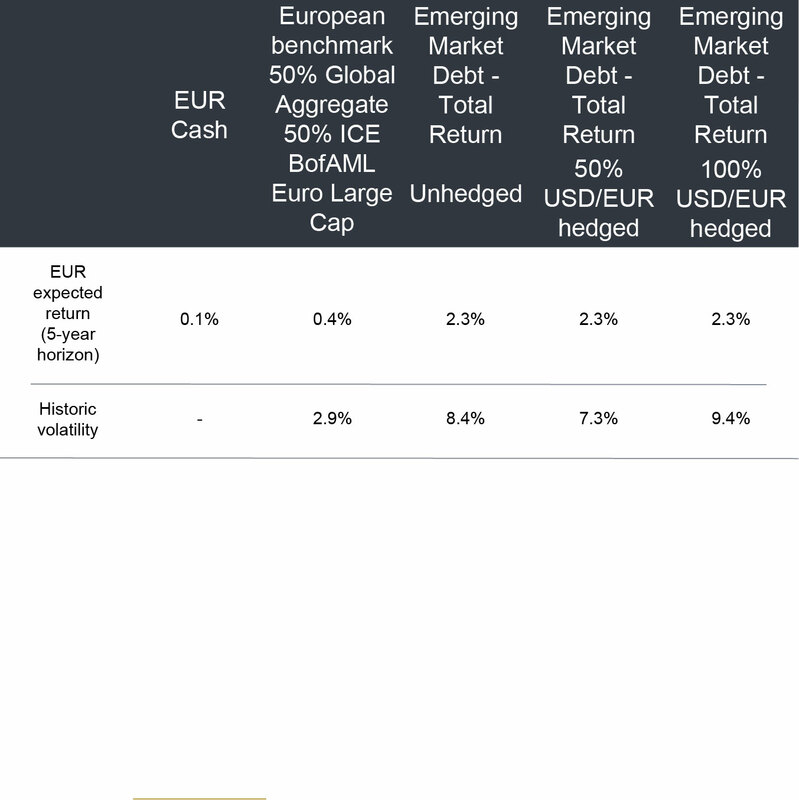 Note: 70, 50 & 20 per cent hedging are considered optimal for USD/EUR hedging for hard currency, total return, and local currency portfolios respectively.Source: Fidelity International, August 2018, based on monthly historic data from July 2004 to July 2018, combines backtested strategic allocation performance of the Fidelity Emerging Market Total Return Debt strategy and live fund performance (gross of fees, from October 2015). Backtested asset allocation comprises of a dynamic blend of the following JPMorgan indices: GBI-EM GD: Global Bond Index – Emerging Markets Global Diversified (Local Currency). CEMBI BD: Corporate Emerging Market Bond Index – Broad Diversified (USD Corporates). EMBIG: Emerging Market Bond Index Global (USD Sovereigns). The impact of hedging or translating from USD to EUR has been calculated from index returns provided by ICE BofAML for US corporates (C0A0). The next question to consider is how much a European investor should allocate to EMD. Assuming exposure via a total return approach, our research suggests that the improvement in expected return for the incremental risk taken is greatest with an allocation of between 10-20 per cent of a bond portfolio. For this calculation, we have estimated risk, correlation and return from a Europe-based investor’s point of view. We have assumed a European benchmark allocation of 50 per cent Barclays Global Aggregate Bond (EUR-hedged) and 50 per cent ICE BofAML Euro Large Cap Index. Risk and correlation have been based on historic relationships. Analysis so far has relied on historic returns. For subsequent analysis, we use forward- looking expected returns from Fidelity’s capital markets assumptions. These start with our expected paths of inflation and economic growth in major markets and our expectations of central banks’ responses to these conditions. To project bond returns we project a path of yields as they revert to our estimate of long-term fair value and adjust for default losses projected by our default model, which incorporates the relationship between default losses and interest rates and economic conditions. To project returns for local currency emerging market debt we start by estimating local currency returns following a similar approach to hard currency bonds. Generally, emerging market economies have high interest rates and inflation, which means we expect their currencies to depreciate over the long-run. We adjust local currency bond returns for this to arrive at expected return in US dollars. Source: Fidelity International, August 2018. Expected returns based on reference allocation without any alpha using Fidelity’s capital markets assumptions. Volatility calculated based on monthly index returns July 2004 to July 2018 based on reference index allocation. Consistent with our study of EMD assets alone, 50 per cent hedging offers attractive risk and return characteristics for European investors in an EMD total return approach when considered alongside a euro benchmark portfolio. We find that allocations of 10 per cent offer a substantial improvement in ex-ante portfolio Sharpe ratio, from 0.10 to 0.17, while only modestly increasing portfolio volatility from 2.9 per cent to 3.0 per cent. Allocations up to and beyond 20 per cent continue to offer improved portfolio efficiency and we believe the optimum allocation will depend on an investor’s risk budget at the portfolio level. Source: Fidelity International, August 2018. Expected Sharpe ratio uses Fidelity’s 5-year capital markets assumptions and considers a benchmark allocation of 50% Barclays Global Aggregate Bond (EUR-hedged) / 50% ICE BofAML Euro Large Cap Index combined with an EMD total return reference allocation of the following JPMorgan indices: 50% GBI-EM GD: Global Bond Index – Emerging Markets Global Diversified (Local Currency). 25% CEMBI BD: Corporate Emerging Market Bond Index – Broad Diversified (USD Corporates). 25% EMBIG: Emerging Market Bond Index Global (USD Sovereigns). This analysis is before any allowance for alpha or fees. Assumes 50% hedging of USD/EUR cross for EMD TR allocation. Volatilities have been based on historic index volatility from July 2004 to July 2018. Allocating to EMD remains a challenge for many investors. 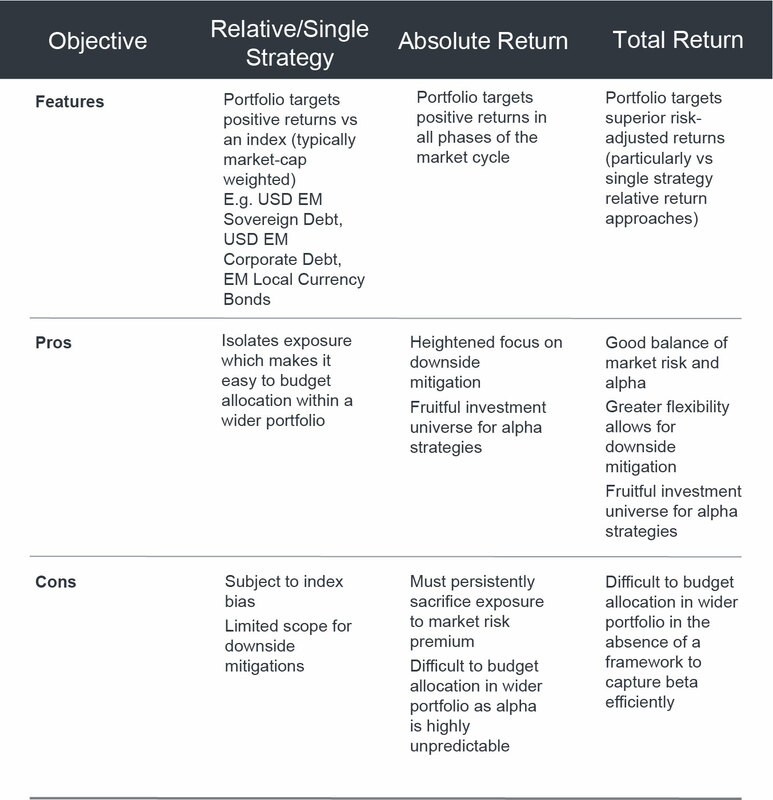 Having a good grasp of the differing objectives of portfolios is an important first step in deciding on an allocation, but investors should look beyond single-strategy approaches that can leave them exposed to benchmark biases. Total return or blended EMD solutions can provide additional drivers of return into a bond portfolio and, in sizing a position, our analysis indicates that between 10-20 per cent is the optimal level of allocation. Currency hedging is another important consideration, but this will depend on the nature of the EMD portfolio. Overall, we believe total return solutions offer the best risk-adjusted return potential and are the best way to capitalise on the EMD risk premium.